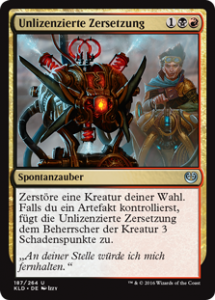 Kleiner Hinweis: Kaladesh-Limited-Spickzettel V0.3 verfügbar! An alle, die meinen Spickzettel heruntergeladen haben oder das für das heutige Prerelease noch vorhaben: Es gibt eine aktualisierte Version (Danke an alle Tippgeber und Fehlerjäger!). Wizards of the Coast, Magic: The Gathering, and their logos are trademarks of Wizards of the Coast LLC in the United States and other countries. ©1993-2012 Wizards a subsidiary of Hasbro, Inc. All Rights Reserved. This website is not affiliated with, endorsed, sponsored, or specifically approved by Wizards of the Coast LLC. This website may use the trademarks and other intellectual property of Wizards of the Coast LLC, which is permitted under Wizards' Fan Site Policy. For example, MAGIC: THE GATHERING is a trademark of Wizards of the Coast. For more information about Wizards of the Coast or any of Wizards' trademarks or other intellectual property, please visit their website at www.wizards.com.